Shortly landing in Amsterdam where I’ll change planes and head home to you, at the end of a 12 hour flight from Hong Kong. I was first in China, in the seaside city of Xiamen and the South West city of Chengdu in Sichuan. Most people in the UK know Sichuan from Chinese takeaway menus, where Sichuan style is a little spicy with a couple of chillies in it. In China, Sichuan is known for having the best food, the prettiest girls and the pandas. I’ve been a few times and have seen the pandas in the sanctuary, climbed some hills in the countryside and have always quite liked it. Like much of mainland China now however, Chengdu lives under a blanket of smog and is an architecturally soulless, vast metropolis in the most part. Town planning has not been a priority in China for the last few decades. Some business colleagues took me out for ‘hot pot’ which is the most famous of Sichuan dishes and revered by its people. 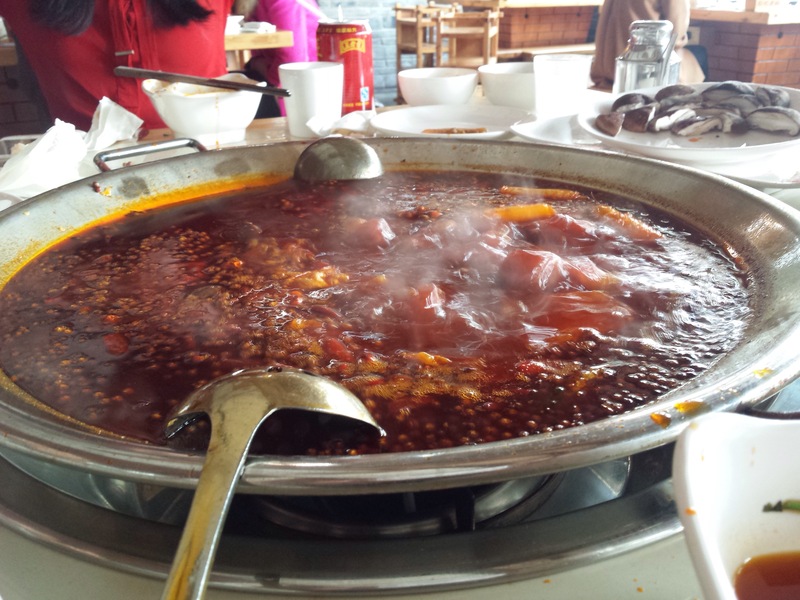 It is essentially a huge dish of bubbling oil absolutely swarming with fierce chillies and Sichuan pepper (known as flower pepper in Chinese) which has a very unique taste. The pot is placed over a burner in the middle of the table and diners choose raw ingredients that are brought to the table and added by those sitting around it. A fantastic business model – your customers cook for themselves! We had strips of pork, meatballs, various vegetables, bamboo, tripe and liver. Anything substantial or tough is left to bubble away for a while but other more slight morsels can be held submerged with chopsticks for a few seconds before devouring, hot, spicy oil dribbling down your chin. Sichuan pepper makes your mouth go numb, a strange sensation when you are eating and unlike the heat from chillies. Those make your nose run and your throat heat up. You sweat. The more of it you eat, the greater the sum total of all this becomes, both uncomfortable and enjoyable at the same time. Beats a sandwich at your desk anyway. Down to Hong Kong and after all the work over a weekend some different colleagues took me out to Mong Kok, Kowloon side for another meal at restaurant London, which is one of the oldest establishments in the city. It is true Hong Kong food, served to round tables. There are tanks near the kitchen full of fish and crustaceans that will soon become dinner, so we chose our lobsters and fresh water fish, looking them in the eye and thanking them for their sacrifice to their graves in our bellies. 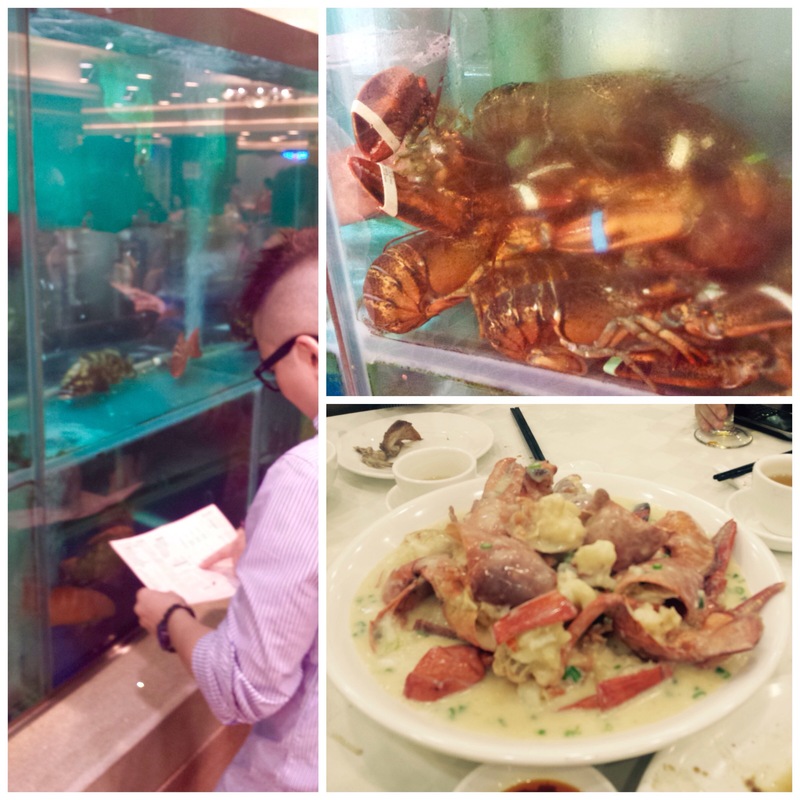 As the food started to arrive, things that stood out were the roast pigeon, complete with roasted head, the chickens feet and the vat of lobsters which had been steamed, covered in a cheese sauce and chopped into large chunks making it almost impossible to eat with chopsticks. Cue very messy foreigners and several plate changes. It was a real feast. Afterwards we walked down Temple Street where you can buy tourist tat and fake designer goods. We made our way to a group of tents at the end where fortune teller will read your palm and predict your fate. We were all going to have this done but the standard price was £35, a bit steep for a bit of fun you don’t actually believe in. Coming in to land now. I’ll get home at around midnight and you’ll both be fast alseep but I can’t wait to see you. Choco-porridge for breakfast and lots of playing with toys, tomorrow will be a good day. I’m just coming to the end of a two week trip to Taiwan and China and am in the usual zombie state brought on by early starts, long days and the exhaustion of travel. Looking forward to getting back to you all and the warmth of home before Christmas. I haven’t written any of these for a while, mainly because I have been going to the same places over and over again, and there seems little new to tell you about. My experiences have not been exceptional for me, although in the past 4 months I’ve been to India, Korea, Brazil and now East Asia in a blur of hotels, airports and forgettable meetings. I’m learning Chinese at the moment, as I am sure you will given the importance of this country in the future of the world. I am beginning to understand the country and the people better because of this, and although it still annoys the hell out of me, I appreciate China more than I used to. It is rapidly changing, and although traditions and the arts are making a resurgence and becoming more valued by everyday Chinese, the cultural revolution of the 1970s is hard to recover from. Free thinking and creative expression was subdued and much of the ancient treasures destroyed along with those that appreciated them. 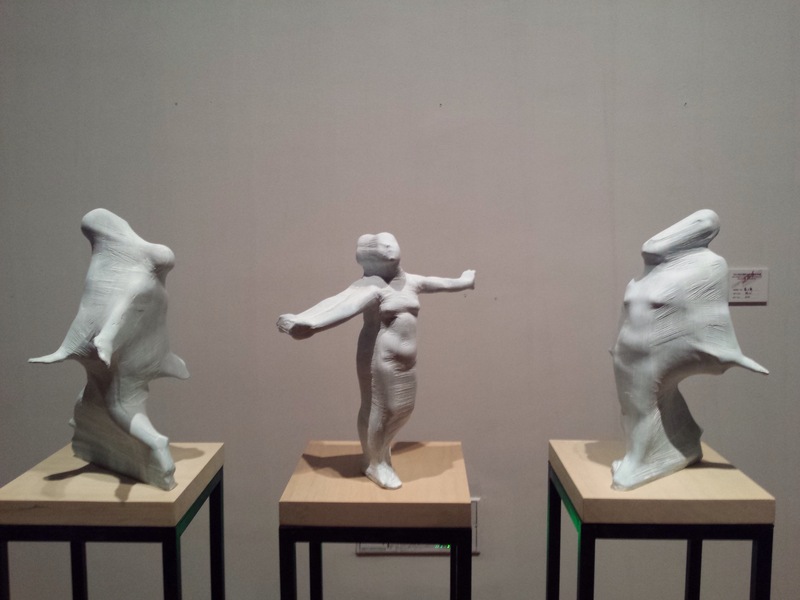 I was fortunate enough to visit some art exhibitions and schools this time and had one wonderful experience I thought I should tell you about. One of the cities on this trip was Xi’an, a former capital of China, still fully encircled by an enormous medieval wall and proud of its heritage and culture. It is seen by Chinese people as a historical city, home to the terracotta warriors and other significant sites, but it is still a rapidly developing and modern Metropolis. 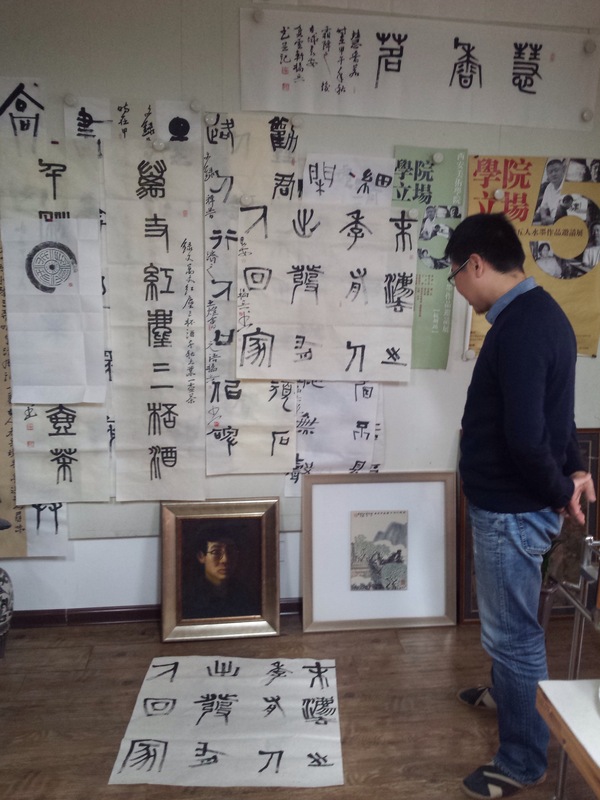 I was visiting Xi’an Academy of Fine Arts, one the “Great Eight” art schools of China and was invited to take traditional tea with a well know calligraphy artist, Yang Bin. His studio was in a tower block on the campus but once inside you could have been in a traditional house. Books lined the walls along with rolls of beautiful calligraphy of various styles. He sat us down at an elegantly carved table and went through the motions of a traditional tea ceremony. Boiled water goes into the pot with loose tea which is then poured out into a glass vessel and then poured back over the tea pot (which sits on a wooden grill over a tray to catch the tea). This gets rid of initial bitterness. The pot is then re-filled and the tea poured into very delicate, tiny, handleless cups and drunk. It tastes great. It feels special. He then asked if we would like a piece of calligraphy to remember our visit by. Of course I said yes and he began his work. He took out a piece of textured rice paper in a fan shape and selected his brush hanging from a dead bonsai tree. His ink was in a large ceramic bowl and he pondered his message before he began, writing in a traditional font. 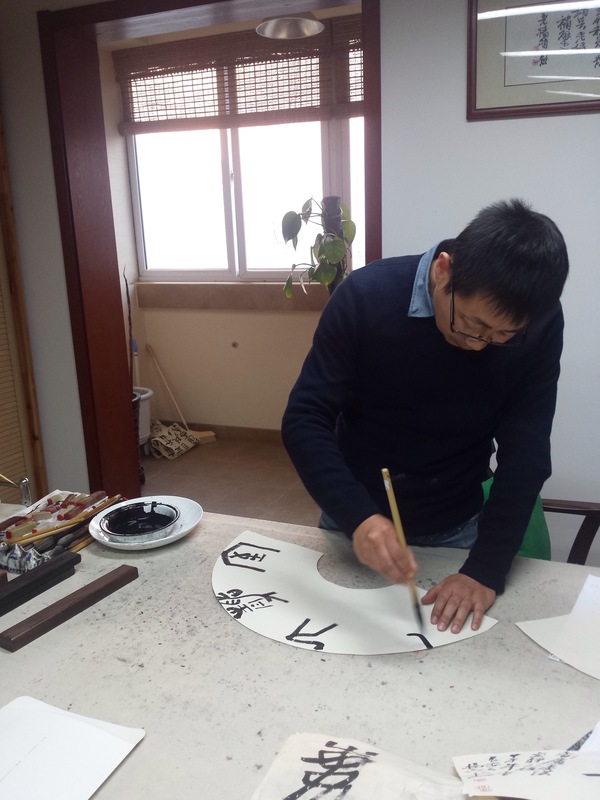 He told me that people sometimes do not value calligraphy as they think it takes no time to produce, but he said he has been in training for over 20 years and it cannot be done by just anyone. Once he had finished the four main characters he signed and dated it in characters also. It reads “all here are striving from calm and elegance” or similar and is a Chinese idyom. He then took the lid of a red ink gum which must be manipulated and the stamp worked into it before pushing it down onto the paper for the “chop”. 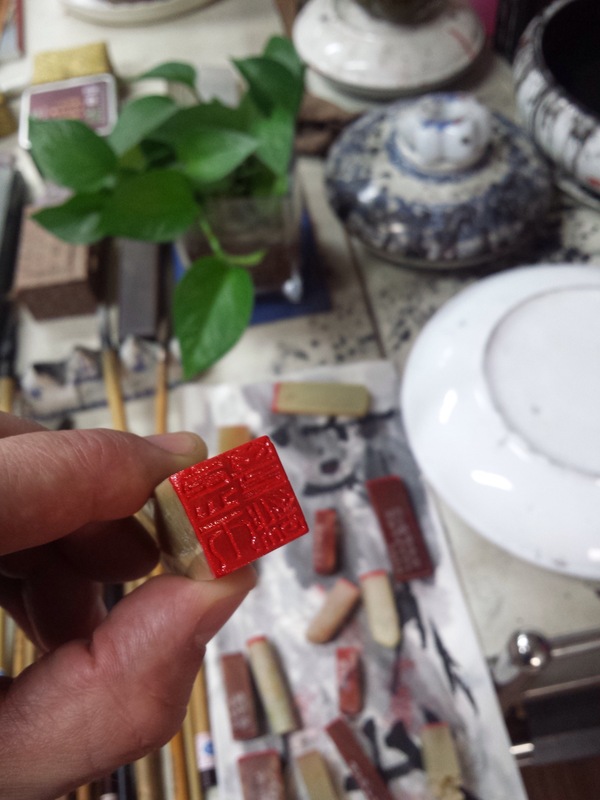 He makes the stamps by carving them painstakingly out of stone. I felt really honoured to be given it and it was a special moment being in his house to witness him work. I tried calligraphy two days later in a studio and was told that I was naturally good at it, must be my artistic youth! I was presented with two calligraphy brushes and intend on practicing. Maybe once I have learned enough I can send Prof. Yang a piece of my own in return. George, you are currently obsessed with Lego and super heroes and are the chattiest of little boys, always full of stories of what has gone on over the last few days. You summarise beautifully for me on Skype. Bea, you are saying your first words, “shoooooooes” and “no way” and couldn’t be cuter when you do. You toddle around with such awareness and are a complete clown, always trying to make people laugh and catch their attention.